After a period of upheaval back in the ‘80s, air traffic controllers hadn’t called for any sort of industrial action until the summer of 2010. Twenty years of social peace during which, together with AENA, the biggest growth of air traffic in our history was successfully dealt with. In 2009, during the negotiations for the second collective agreement, the Minister of Transport, José Blanco, together with the CEOs of AENA, followed Enrique Barón’s example in the eighties and organised an intense and manipulative campaign to discredit air traffic controllers in order to raise the airspace users, the airlines and the general public against them. The company didn’t roster enough people in the units, and this led to important delays that later would be blamed on a covered strike (that is, work to the rule), which was a complete fallacy. USCA won a court case against a newspaper that accused Barajas airport controllers of provoking delays on New Year’s Day because they went to work with a hangover. In the court resolution it was clear that AENA was behind it all, and the judge forced the newspaper to publish the following headlines instead: “AENA’s deficient rostering led to the closure of runways on the first day of the year”. The discrediting campaign was also based on false figures regarding the controllers’ productivity, which AENA had sent to Eurocontrol in their annual report. The newspaper ABC, through one of their best research journalists, Javier Chicote, published the truth on April 2012. And Andrés Ayala himself, who was the speaker of the PP (Popular Party) in the Transport Commission of the Congress, uncovered the ploy in a session of the Parliament. On the 5th of February 2010, the Socialist Government, with José Blanco, Minister for Transport, in the lead, passed a Royal Decree (RD 1/2010) that declared null the Collective Labour Agreement (CLA) that the air traffic controllers had had so far. This action was a very suspicious legal adjustment that had no precedent in the history of labour relations in Spain. It was so extraordinary that it had to be derogated by the Law 9/2010 on the 14th April 2010, which partially sorted out some of the mistakes. Both rules were heavily criticised from the very beginning by all sectors involved in the air traffic management, being branded as hasty and with severe planning and technical deficiencies. However, the masterminds maintained a stubborn attitude, because they were aware that any filtration to the public of the detected deficiencies would have a high political cost. This was so because this legal modification, affecting the controllers, had become a political flag, eerily hoisted by the minister José Blanco. Acting as a smoke screen for the privatization of AENA, that was being carried out in the shadow; the discrediting campaign had to be intensified in order to cover up the mistakes of those hasty rules. From the beginning it was evident that disastrous consequences were about to be unleashed. The media pressure was so powerful that it played a key role in the fact that all the social agents, the press and the judiciary, supported the new rules. Among many other things, this law increased the compulsory annual working hours from 1200 to 1670, well above the media in other European countries. It also reduced drastically the breaks within the shifts. The compulsory safety assessments, essential to comply with European regulation and the national law regarding risk prevention at the workplace (health and safety), were not carried out either. AENA abused the new regulation denying leave and holidays, turning down nursing and maternity leave, rostering over 25 days on a row, with the assignment of compulsory shifts in the few days off… and these are just some examples. Everything under a constant threatening environment supported by the relentless manipulative media campaign carried out by AENA and the Minister of Transport. Meanwhile, the Royal Decree 1001/2010 was passed, legally limiting the maximum annual working hours in 1670. As the year progressed, it became evident that AENA, due to its bad management, was going to be unable to comply with the rule: Controllers were going to have to work over the limited number of hours legally established. In order to mitigate what would end up in the collapse of the Spanish airspace by the end of the year, management in AENA forced their controllers to go to work illegal, joining radar and tower positions in Santiago de Compostela, and under staffing many units, which generated thousands of minutes of delays and losses of billions of euros for the companies. Some controllers refused to work in such conditions, since the illegal configurations could have fearful penal consequences in the event of an incident or an accident. 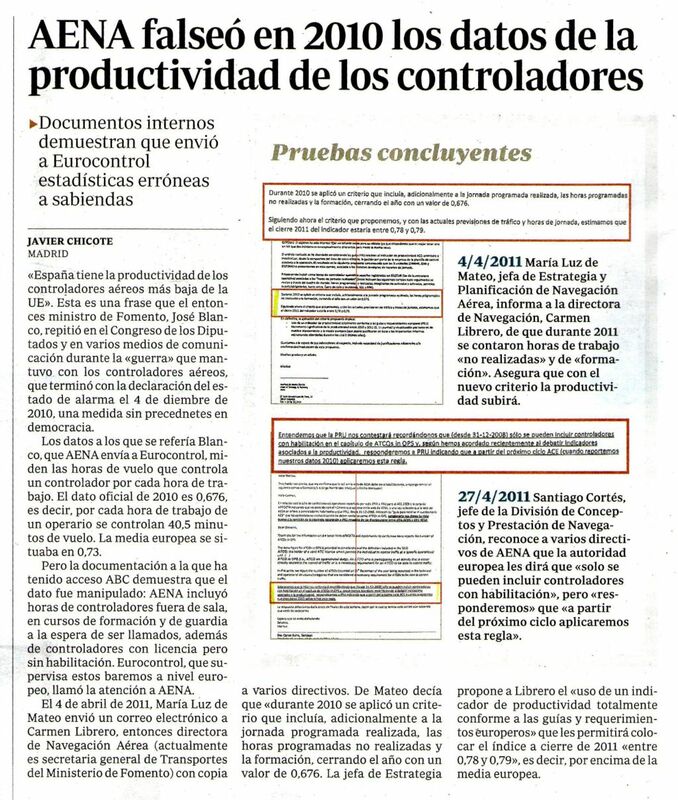 Surprisingly enough AESA, the Spanish safety agency, opened files against these controllers instead of sanctioning the company. USCA and the whole collective in general, through its spokespeople, lead by César Cabo, strived to explain to the general public how was the situation that was being experienced inside the operations rooms and control towers. By the end of November, it became obvious that AENA could not guarantee the provision of the service. The tension was unbearable and hampered the safety of the operations. Later, Eurocontrol would publish a report that would reveal the spine-chilling figure of 47 mid-air near collisions during 2010. On 26th November, AENA tried to conceal their error regarding the working-hours accounting. 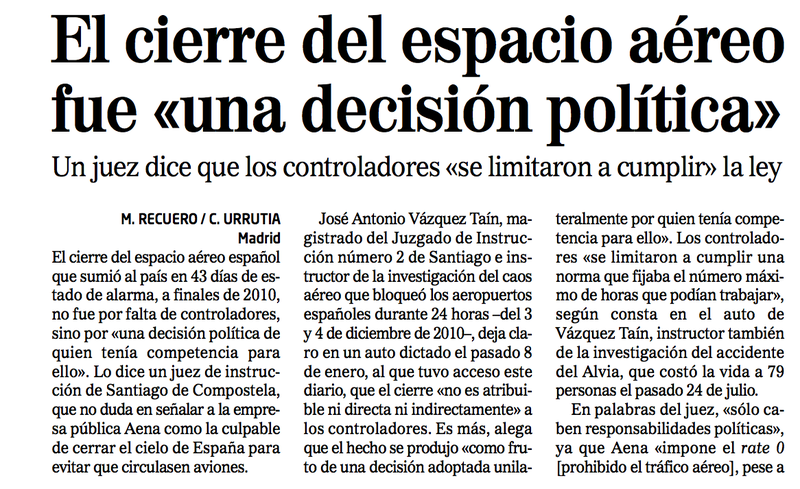 They sent a letter to AESA (the Spanish Air Safety Agency), asking for permission to increase them. This letter acknowledged that the controllers had already exceeded their permitted annual working hours. However, on the same day, a press release deceived the public assuring that this was not the case with any air traffic controller. On 29th November, the State Attorney turned down AENA’s attempt to increase the working hours of the controllers, and blamed AENA for their lack of foresight and a poor management of their human resources. This resolution ment that four days later, on the 30th, the Director of AESA rejected AENA’s request, since the cases referred by the current legislation did not concur. It also meant that by mid-December half of the controllers would reach their maximum number of legally permitted working hours, and Aena would be forced to put restrictions to the traffic, thus collapsing the airspace. On 2nd December, rumour spread in all control units that the Government was planning to militarize the air traffic controllers. Many of those working on those days, after almost a year of abuses and vexations, couldn’t stand the pressure anymore and broke down. 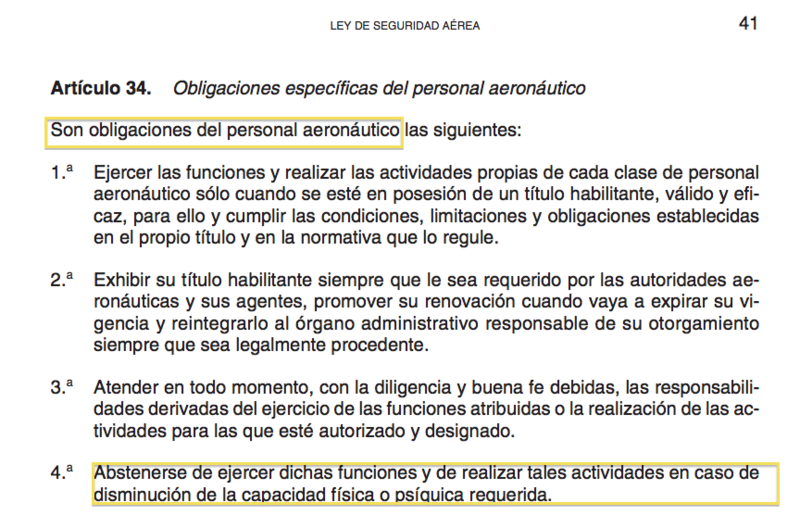 Surprisingly enough, AENA managers had distributed, at national level, from noon on the 3rd on, the form that had to be used in case of the need to apply the article 34.4 of the Spanish Air Safety 34.4. The new protocol contemplated how to remove air traffic controllers from their working position in case of provisional inability, but not how to put them back. Controllers were forced to follow a procedure which AENA itself didn’t comply with, and this was a fundamental ingredient in the collapse of the system we all know about,o, despite the fact that not a single air traffic controller abandoned his or her working position. The new procedure that AENA demanded proved to be so disastrous that it was derogated that very night. 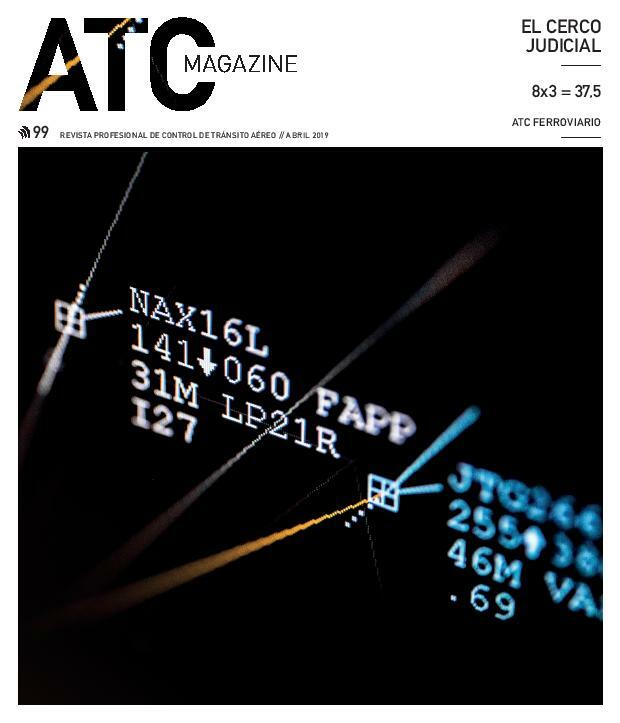 The Ministry of Transport and AENA used the PA system to announce that the controllers were “massively abandoning their working positions”, and with no other justification they decided to close the airspace. The Government published a new Royal Decree which transferred the competencies of AENA to the Ministry of Defence, and after that, air traffic controllers were militarized. This was the way they quickly solved the problems derived from a poorly developed legislation… but nonetheless the whole society came down hard on the controllers. Several months later, the ex-Minister of Labour, Mr Manuel Pimentel, led an arbitration which would result in a binding decision published on the 28th of February 2011. 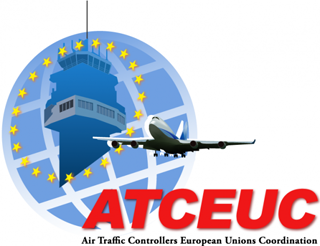 The National Assembly of USCA accepted and ratified this new collective agreement on the 1st of March, but ENAIRE (the name of the new air navigation service provider that resulted from the privatization of the airports side of AENA) has not complied with many of the rules imposed by the arbitrator in areas like working hours, pay or professional career. This CLA was supposed to be valid until December 2013. However, it was extended and it is still valid, while the controllers and ENAIRE continue their negotiations to sign the third CLA. In August 2012 a new executive board took over in USCA, and Miguel Ángel Serra Biarnés became the new president. The change of government and the conciliating attitude of the new Minister of Transport, Mrs. Ana Pastor, favoured an honest approach from all sides. However, the sequels in the controllers after the conflict have turned AENA in a deeply sick company, in which mutual distrust hampers the relationship between employer and employees. The fight against the old management and Blanco left a trail of labour, administrative and penal files that seriously threatens the provision of the service. The good news is that 21 courts all over Spain have already resolved that there was no such abandonment or fault of any kind on the side of the controllers. Some sentences, like the one written by the judge Mr. Vázquez Taín, clearly expose the mishandling that the managers in AENA made, and which eventually led to the conflict. The safe exercise of the profession of an air traffic controller is absolutely incompatible with the psychological impact that this sort of actions has in the people. However, both the collective and the union, after these hard times, are more united than ever. We are convinced that the truth will be revealed, and that after resolving 21 out of 23 court cases in our favour, justice will be made to the controllers and to the people that were affected by the closure of the airspace in 2010, closure that was provoked by the leaders in the Ministry of Transport and AENA. We look into the future with the hope to recover as soon as possible a relationship based on cooperation and mutual trust, which will help us face the challenges that are to come.